Bob Wabnitz, artist, teacher and mentor, passed away last summer at the age of 82. Mr. Wabnitz had studied medical illustration under Natt Jacobs at the University of Rochester in Rochester, NY, and for many years directed their Medical Illustration Unit. In the early 70's he taught a class in Preparation of Biomedical Visuals in RIT's then new program in Biomedical Photography, and was responsible for the establishment of a BFA degree curriculum in Medical Illustration at the school a few years later. Bob is fondly remembered by colleagues and former students alike as a kind, gentle man with a passion for teaching and an infectious sense of humor. Figure 1. 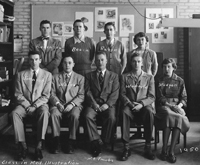 The Medical Illustration class at the University of Rochester School of Medicine, 1950. Natt Jacobs is seated, center. Bob Wabnitz is seated next to him, 2nd from the right. Also in the photo are Marjorie Stodgell and Bob Beach. After graduation, Stodgell was a medical artist at Hahnemann Medical College in Philadelphia and went on to become a well-known illustrator of flower and gardening books. Beach spent nearly 40 years at the University of Florida School of Medicine, first as Chairman of the Graphics and Learning Resources Department and later as Medical Illustrator in the Department of Neurosurgery. Figure 2. 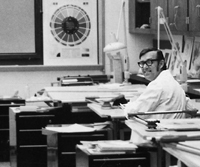 Bob Wabnitz at work in the studio, University of Rochester Medical Center, 1970s. Figure 3. Bob clowning around with the RIT Medical Illustration graduating class, May 1985. Glen Hintz (back) joined the RIT Medical Illustration faculty in 1983. Figure 4. Bob Wabnitz demonstrating the carbon dust technique at RIT, late 1980s. Some of the older Association of Medical Illustrators (AMI) members may remember Bob Wabnitz, but the name is probably unfamiliar to most of our younger members. He was active in the AMI during the 1960s and 70s, but gradually distanced himself as he devoted more of his time to teaching and family. Since 1998, he was bedridden following a severe stroke and passed away last summer at the age of 82. For those of you who knew him, I hope to reacquaint you. For those who didn’t, I hope to introduce you to a man who was a passionate teacher and a talented medical illustrator. Robert C. Wabnitz was born May 11, 1925 in Rochester, New York, and, like most of us in this profession, showed an early interest in art. His aspirations were cut short by World War II when, upon reaching the legal age, he followed his older brother into the army. Like many young soldiers, Bob spent his idle hours writing letters to home. However, unlike most of the GIs, his letters were adorned with drawings of his experiences and the life of a soldier. Eventually, he gave up writing altogether, preferring to send just drawings. Bob spent the next several months recuperating from his wound with lots of time to devote to his drawings. He later assembled many of these drawings into a montage for an RIT faculty art exhibit. Resembling Bill Mauldin’s “Willy and Joe” cartoons, they depict the life of a soldier and the rigors of combat. Returning home at war’s end, Bob attended RIT , receiving an art degree in 1948. It was during this time that he met Natt Jacobs, a medical illustrator at the University of Rochester School of Medicine. Jacobs, also an RIT alumnus, had studied under Max Brödel at The Johns Hopkins University School of Medicine in the mid-1920s, and returned to Rochester when the medical school opened in 1925. It’s not clear exactly when Bob decided to study medical illustration, but it’s certain that Jacobs had something to do with that decision. Had it been ten years earlier, Jacobs would have referred Bob to Johns Hopkins to study under Brödel. Jacobs is quoted as saying, “…if a person wanted to be a medical illustrator, he should go to the best, and that was Max Brödel.” In fact, Jacobs had already sent several other RIT alumni to Hopkins, including Mel Diedrich and Elon Clark. At the time Bob decided to study medical illustration, Brödel had already retired (1940) and passed away a year later . Subsequently, Jacobs started his own program at the University of Rochester Medical Center. In 1947, Jacobs was appointed assistant professor of medical illustration in the Department of Anatomy and the program officially opened the following year. Bob Wabnitz was part of the first class of five students, using his G I Bill benefits to complete the three-year program. Bob received his certificate of Art as Applied to Medicine in 1951 and was immediately hired as a medical artist at the James Kennedy V A Hospital in Memphis, Tennessee. During this time, he collaborated with Dr. Charles Mayo Goss, professor of anatomy at Louisiana State University, to complete new artwork for the 26th edition of Gray’s Anatomy (1954), including all of the “tissue drawings” (e.g., the structure of muscle and bone, as well as histologic cross-sections). Shortly thereafter, he relocated to New York City where he was staff medical illustrator at St. Clare’s Hospital. He continued his work with Dr. Goss on new illustrations for the 100th Anniversary Edition of Gray’s, which was released in 1959. When Natt Jacobs passed away in 1959, the University of Rochester medical illustration program closed its doors. Although Mel Diedrich from the University of Buffalo helped the remaining students complete their studies, there were no immediate plans to continue the program. In 1960, Bob Wabnitz returned to Rochester to replace Jacobs as head of the service unit, but the teaching program remained closed. Bob continued to direct the medical illustration unit for the next 25 years and held the position of research associate at the University of Rochester until his retirement in 1998. Despite the success of the service unit, Bob’s primary goal was to re-open the medical illustration training program. Anyone who spent time with Bob knew that he was a bit of a ham, a natural born actor— one of the most important qualities of a teacher (as I know from personal experience). It’s clear that, in addition to medical art, teaching was his passion. Bob tried on several occasions to convince the University of Rochester administration to re-open the training program. He even took on student interns to provide them with informal, on-the-job training. He also approached other universities, including his alma mater RIT, to see if they had any interest in supporting such a program. As luck would have it, RIT was in the process of creating a degree program in biomedical photography, the first of its kind. In 1968, RIT’s School of Photography received a $280,000 grant from the U S Department of Health, Education, and Welfare to explore the feasibility of such a program. The program opened in 1970 with several well-known medical photographers on its faculty and generous support from Rochester’s biggest employer, the Eastman Kodak company. Bob Wabnitz was recruited to offer a course in the preparation of biomedical visuals. Bob quickly capitalized on his new RIT connections. 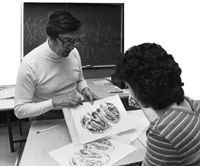 In 1971, he met with the dean of the College of Fine and Applied Arts and submitted a written proposal for a four-year bachelor of fine arts degree program in medical illustration. It took several more years and at least one more proposal, but the program was finally approved and admitted its first students in 1977. Several students who were already at RIT transferred into the new program and graduated as early as 1979. The first year of the BFA program closely paralleled that of any other art degree— a year of foundations drawing, as well as 2D and 3D design. In the second year, students took general biology and were introduced to the general principles of medical and scientific illustration. They also took courses in figure drawing, photography, and the preparation of visuals for slides, video, and television. The core of the program began in the third year with human gross anatomy, taught at the University of Rochester School of Medicine. This is also when students were introduced to the “Brödel techniques” of carbon dust and ink, along with watercolor, colored pencil, and other media. Thanks to Bob’s connections at the medical center, much of the fourth year was devoted to surgical observation in the operating room and drawing specimens from the university’s extensive pathology collections. While Bob was still negotiating with RIT to create the undergraduate program, the University of Rochester began to consider the idea of re-opening their training program for medical illustrators. They were developing a new master’s degree program in health sciences education with concentrations in instructional technology and instructional research methodology. Bob proposed a third track in medical illustration. The new three-track program was approved and began accepting students in 1975. In 1978, the University of Rochester phased out all of its allied health programs for financial reasons. After just three short years, the health science education tracks were dropped. In the aftermath, several of the university’s allied health programs found a new home at RIT. Bob relocated the master’s program to RIT in 1981 and the first student graduated in 1983. Also in 1983, RIT hired a second full-time faculty member, Glen Hintz, to assist with the growing responsibilities of the two programs. The undergraduate and graduate programs have operated at RIT ever since, while still maintaining a strong affiliation with the University of Rochester School of Medicine. After a 47-year career and 28 years of teaching in various capacities, Bob retired in 1998. He trained over 200 students, many of whom hold positions at prestigious medical centers (Mayo Clinic, Johns Hopkins, Duke, Cornell), art studios (A.D.A.M., Nucleus, MEDSN), medical product companies (Merck, Pfizer, Laerdal) and other well-known institutions (the Smithsonian and the American Museum of Natural History), as well as the New England Journal of Medicine. Bob was also well known for his offbeat sense of humor and for his antics during the annual Wabby Awards ceremony. Although the awards were originally named for his brother who was killed in the war, Bob quickly adopted the same nickname. He loved to dress up in costume and threw outrageous Halloween parties. “He was a real nut,” recalls Moldoff. I couldn’t agree more. Bob had a profound affect on my life, both professionally and personally. I vividly recall our first meeting while I was still a graduate student at the University of Rochester, taking Gross Anatomy in the School of Medicine. I had already decided not to continue with my PhD, but I had no idea what else to do with my life. I had an interest in art, but hadn’t drawn a thing since high school. I was intrigued by the illustrations in my anatomy books and soon learned that there was a medical illustrator right in the same building. Bob was probably skeptical when he first looked at my “portfolio” — nothing more than crude doodles in the margins of my anatomy notebook. Rather than sending me on my way, he gave me some pointers and politely suggested that I take night classes at RIT to bring my skills up to speed. He continued to provide feedback and encouragement as I progressed toward my goal. Two years later, I was accepted to the RIT master’s program. In the years that followed, especially when I took over his position at RIT, I have always modeled my teaching style after our beloved Wabby. I think I’ve mastered his calm demeanor, although I’m much less likely to dress up like a bee. Thank you for letting me share these thoughts on a great artist, teacher, and friend. Jim Perkins is Associate Professor of Medical Illustration at Rochester Institute of Technology (RIT) and Adjunct Clinical Instructor in Anatomy for the Ithaca College School of Health Sciences and Human Performance. He is a Board Certified Medical Illustrator, a Fellow of the Association of Medical Illustrators, and currently serves on the Board of Directors of the Vesalius Trust for Visual Communication in the Health Sciences. After pursuing graduate training in vertebrate paleontology and anatomy, Jim studied medical illustration with Bob Wabnitz at RIT in the early 1990s.